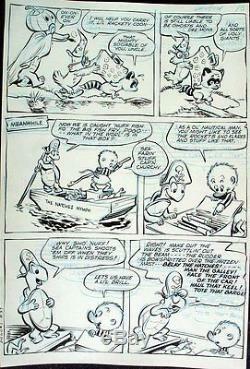 This original art is by Walt Kelly for issue # 1 of Pogo Possum from 1949. Kelly's Pogo newspaper strip has become an American institution. The art area on this page is about 10 1/2" by 15 1/2", and the page features many of the most popular characters, including Pogo, Albert, Churchy and Owl. It is in very nice shape. WE HAVE LOTS MORE ARTWORK ON OUR WEB SITE. The item "WALT KELLY ART FROM 1ST ISSUE OF POGO POSSUM (1949) POGO + ALL THE GANG" is in sale since Wednesday, June 26, 2013. This item is in the category "Collectibles\Comics\Original Comic Art\Interior Pages". The seller is "kirbyfan44" and is located in Simi Valley, California. This item can be shipped to United States, all countries in Europe, Canada, Japan, Australia.